Want to risk your paycheck to feel like a winner? How about trying iPhone casino games? As Apple brought out the iPhone, they unwittingly revolutionized the entire online gambling industry. Without knowing, they made it simpler, easier and more convenient to play online casino games than ever before. As we all know, the thrill of roulette, the anticipation of slots and the skill of poker all come through in a good casino or dice game. And you can even challenge friends or strangers, as you compete for digital funny money. However, there are hundreds of casino games for iPhone that are available for players on the market. And it is quite difficult to make up minds and select the best iPhone casino games. To help players and make their mobile gambling experience as easy and as smooth as possible, we came up with a list that contains top 3 iPhone casino games in the industry. We can’t simply say if gambling is good or bad, but you should always try not to get addicted to it. How to install those casino games onto iPhone from a PC? 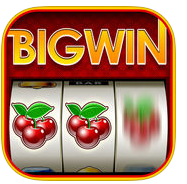 If you love free slot machines and authentic Vegas slots, you’ll love the original, Big Win Slots. It’s one of the fast, free iPhone casino games. With exciting bonus games and real Vegas rules, Big Win Slots is the only game that brings the Strip to you. This app offers both 3-reel and 5-reel games. As you play, you can earn VIP Credits, which can be used across all Mobile Deluxe™ games. As one of the free iPhone casino games, Big Fish Casino gives you the chance to WIN BIG in Slots, including Crazy Money® Deluxe™ by Incredible Technologies, Inc. It includes Blackjack, Texas Hold’em Poker, Roulette, and more which would allow you to play live with your friends. You can experience all the fun you can have in Las Vegas! Make a fortune with HUGE Jackpots, Free Daily Games, Slots Bonus Games, and more! Will you play it safe and hold your cards, or double down and get a lucky ace? Over 16 BILLION chips in Jackpots given out each day! If you love to play slots for fun, you’ve come to the right place! You can try out two fascinating Wheel of Fortune’s casino slots: Spin the reels in the electrifying spirit of the casinos of Las Vegas with Vegas edition! Have fun with the Classic Edition of fruit machines. You can also check out the dazzling slots version of Deal or No Deal and battle the Banker! You can score FREE 12,500 bonus Tokens when you register to play. Try the casino games for iPhone now! 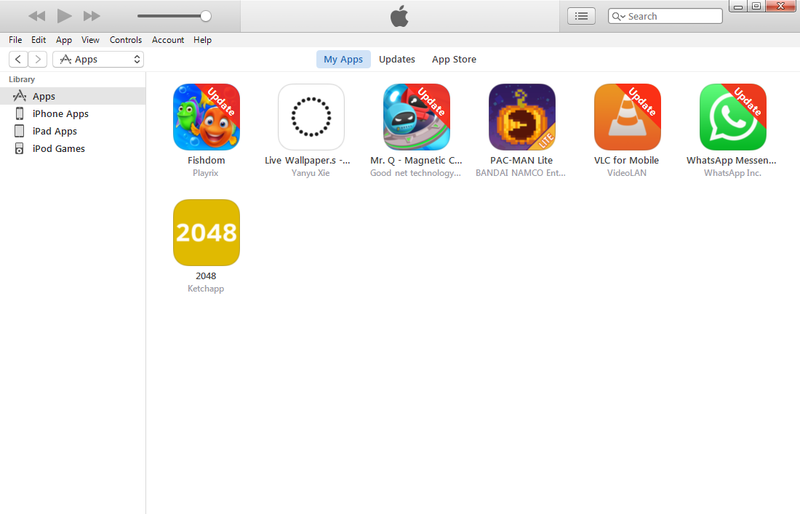 After we know and download the top 3 iPhone casino games from iTunes in PC, we need to install them in the iPhone. If you are not able to connect your iPhone to a solid Wi-Fi network, try using your computer to install those games onto your iPhone. To do this, you’ll need a powerful software, Leawo iTransfer. 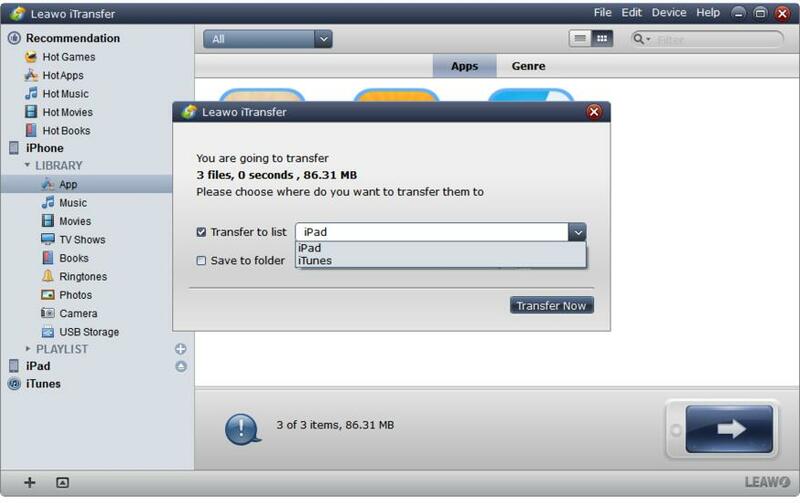 iTransfer provides perfect solutions for iPhone transfer issues. 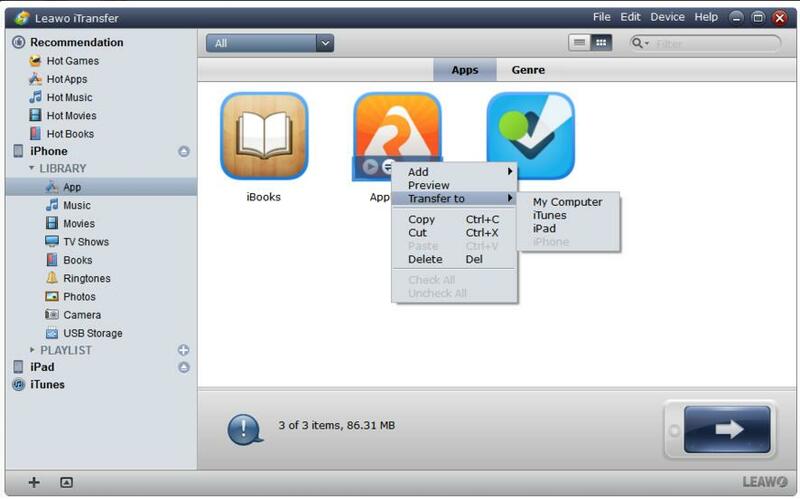 It can be used for transferring many kinds of files among iOS devices, iTunes and PCs, such as apps, message, photos… Leawo iTransfer is also helpful for backing up iPhone files to computer. It makes the iPhone as flash drives so that users can put anything they want into their iOS devices. Below I will show you how to install these best iPhone casino games onto iPhone with 4 simple steps using Leawo iTransfer. Step 1. 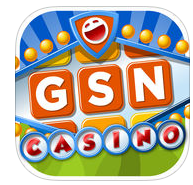 Go to App Store in iTunes to download the iPhone casino games you want to install. Step 2. Download, install and launch Leawo iTransfer in your PC. Connect the iPhone to PC with a USB cable. Usually, the software will automatically detect the iPhone. Click on iTunes Library to see more options. Step 3. Click on App under iTunes Library to check out the iPhone casino apps you just downloaded, select the ones you want to install onto your iPhone, right-click them and choose Transfer to > iPhone, or you can click the Transfer button after selecting them. Step4. After clicking the transfer button, these apps will start to transfer from iTunes to your phone. In the meantime, you can also notice the transfer process. 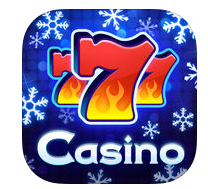 After browsing our top 3 iPhone casino games above, have you found the ones you like? If you do decide these iPhone casino games are for you, then there are a few rules you should try to follow. You should have a fixed amount of money you are prepared to lose, and limit yourself to only losing that amount. Regardless of whether the rules are simple or not though, it’s very important that you fully understand them before playing any game. You’ll never know the perfect time to stop, but you need to make sure that you quit at a point when you’re still ahead. If you feel like you are getting addicted to gambling, try distracting yourself from them and do something else or play another game. Check out our recommendation of the top 5 tower defense games, these interesting games should be able to distract you from getting addicted to gambling.